While the purchase of a new garage door is widely regarded as one of the most financially sound home improvements you can make, with studies showing that they retain 76% of their value, garage door openers are perhaps one of the most convenient purchases you can make. In addition to making your life easier they can also improve both security and safety at your home. Prestige Doors offers a range of different garage door openers to clients in Edmonton and surrounding areas. Chain Driven Systems – The most cost efficient types of system out there, a chain-drive garage door opener utilizes a chain similar to that found on a bicycle to lower and raise the door. This type of system is best suited to a detached garage due to the amount of noise generated when in use. Belt Driven Systems – These are very similar to chain driven systems, except a high strength belt (typically manufactured from fiberglass, steel reinforced rubber or polyurethane) is used rather than a chain. The concept is the same, but they are a lot quieter than chain driven systems and cost a little more. 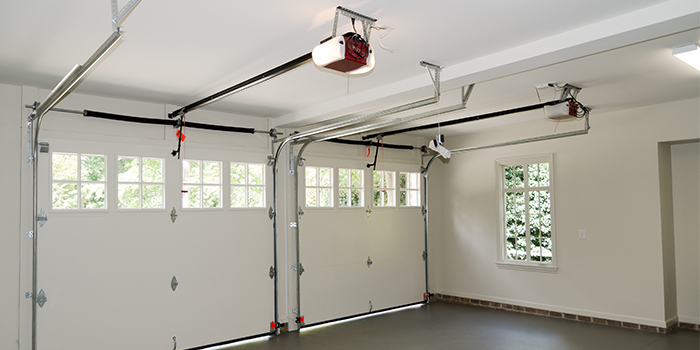 Screw Driven Systems – Screw driven garage door openers offer more power than both belt or chain systems, making them the ideal for choice for heavier garage doors. Rather than using a belt or a chain to open and close the door, a threaded steel rod is used, creating less noise than a chain driven system, but more than a belt driven system. Direct Drive Systems – With a direct drive opener the motor does all of the heavy lifting and isn’t assisted by a secondary component like with the other types of opener. The motor moves along a chain that remains stationary, connects to a J-arm and then raises the door. If you have Prestige Doors come out to your location and fit a garage door opener you will never have to get out of your car to open the garage door in the pouring rain or freezing cold again. Getting out of your car in the dark is a risk you don’t have to take. Our garage door openers ensure you only exit your car once you are safely inside your garage and the door has closed behind you. A garage door fitted with a door opener system is harder to force open and dramatically reduce the chances of your garage being burgled. Garage door openers are a desirable feature that will impress any prospective buyer should you decide to sell up. For garage door openers call Prestige Doors at (780) 665-4666.